Seat belt use for kids over age 8 declines every year after booster seats are no longer required. Seat belts provide the best chance of surviving a crash. The best time to instill safe passenger and driving practices is long before a teen gets a license- driver education starts with parents as role models. 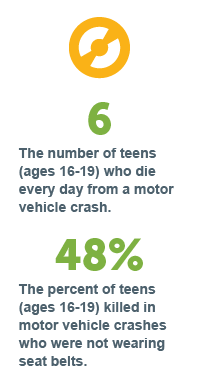 Teens are at greatest risk for death and injury on roadways in the US. This is the time when they most need to use seat belts, avoid distraction and impairment. But it is at this time when we see seat belt use decline and risky behaviors emerge. Safe Kids created Countdown2Drive, a national education program designed to help parents begin a discussion about what teens need to do before they drive to demonstrate they are ready for the responsibility of taking the family car on the road. This initiative is an easy to use, Web-based program designed to help parents discuss and reinforce key safety habits with their kids that can protect them when riding with other drivers. These same behaviors will help keep teens safe after they earn a driver’s license. A key component of the Countdown2Drive Program is a parent-child Passenger Agreement. Parents and their kids can use the free Web tool at www.countdown2drive.org to establish and customize family rules and guidelines – complete with rewards and consequences. The agreement reinforces important safety behaviors such as always wearing a safety belt, reducing driver distraction and checking in with parents regularly. Many Safe Kids coalitions across the country use Countdown2Drive when talking to parents of pre-drivers. Our work to promote safety behind the wheel is made possible by General Motors, a company widely recognized for their continuing commitment and dedication to children and families.